I apologize again for never ever measuring spices! I am a shake and eye ball kind of girl but I used in the neighborhood of 2 tsp of salt, 1.5 tsp of pepper, 1 tsp of garlic powder, rosemary, and poultry seasoning. I just added a shake or two of ginger. Slice the acorn squash in half (without losing a limb) and scoop out the seeds. Spray or brush the cut sides of the squash LIGHTLY with oil. I sprayed mine very minimally. Put the chicken breast and squash in separate pans and pop them into the oven (don’t prep the chicken, just cook it). As soon as you put the squash & chicken in the oven, start cooking the quinoa. Chop and prepare any veggies. Start sauteeing the onions in 1 Tbsp of oil. When they start to carmelize, add the fresh garlic and the mushrooms. Season, season, season. Add the cubed bread, liquid aminos, broth, and handful of kale – heat through. When the quinoa is finished, add that and set the stuffing aside. Remove the chicken and squash from the oven when fully cooked. Cube the chicken and add it to the stuffing mixture. 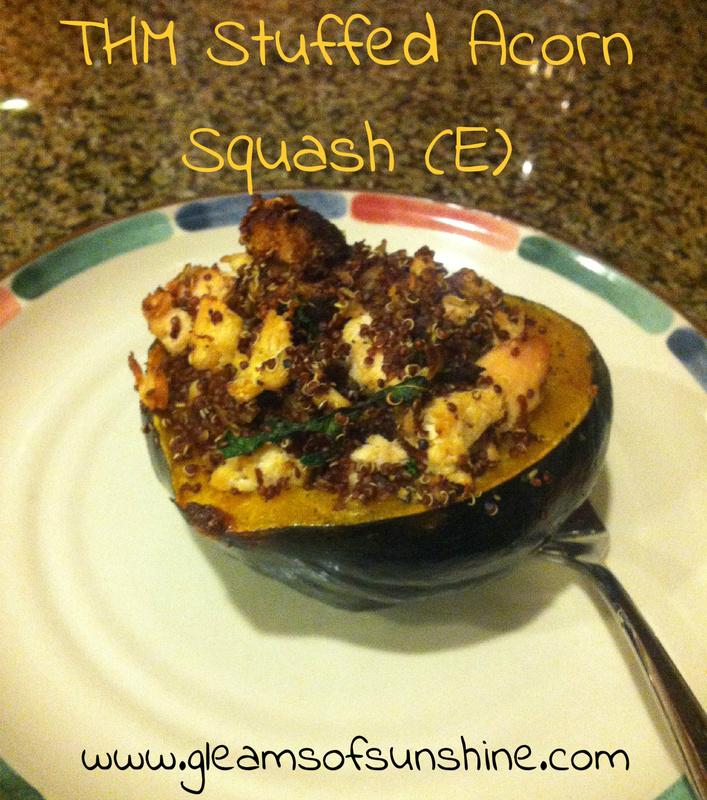 Stuff the acorn squash (really pile it on!) and bake an additional 15 minutes. Drool. Eat. Enjoy every bite. Fat – 7.9 grams (that includes the chicken, which should not be counted if you are a THM). Saturated fat – 1.4 grams. Polyunsaturated fat – 1.3 grams. Monounsaturated fat – 3.5 grams. Carbohydrates – 45.6 grams. Fiber – 3.5 grams. Sugar – 3.7 grams.